In 1979, Robert Crumb published a 12 panel comic, A Short History of America, depicting the changes brought on by industrialization to one corner of the typical American landscape. Though most representative of a mid-western farm-turned-manufacturing town, the comic spans a century and a half telling the familiar story of the railroad arriving in the early-to-mid 19th century and the subsequent development of farmsteads, warehouses, transit, streets, commerce, and automobiles. Also created were three additional panels showing possible future conditions, including total ecological disaster, technological utopia, and ecological utopia. I was first shown this comic as an undergrad in 2010 by a professor in the School of Art, Architecture, and Historic Preservation at Roger Williams University and while I hadn’t viewed the cartoon again until very recently, these images no doubt influenced my efforts over the last two years to visualize the regional changes of American metropolitan areas in general, but of Greater New Haven in particular. Though my maps and diagrams span nearly four centuries, Crumb’s cartoons can be viewed in concert with many of the images below. While Crumb’s cartoon is perhaps most representative of the rapid industrialization of midwestern towns, the diagram above – having been modeled after Greater New Haven – is more closely related to northeastern regions that have a maritime colonial past. In plan the urban form of Greater New Haven is shown changing from seasonally-inhabited aboriginal encampments to a dispersed constellation of Colonial villages to a compact monocentric industrial city to the sprawling polycentric region of today. The diagrammatic section on top, while not to scale with the map, does indicate the character of that urban form throughout its various periods of change. Each section drawing from the different eras have been extracted, labeled, and described below as they relate to the typical development of American metropolitan regions. Millennia prior to the arrival of Europeans to the North American Continent beginning in the 15th Century, explorers crossed the Bering Strait from Asia. Disseminating throughout the Americas to the south and east, these early travelers inhabited much of the land between the Pacific and Atlantic Oceans within a variety of hunter-gatherer tribes, simple farming societies, and complex civilizations. In the eastern portion of North America, woodland tribes of hunters and gatherers foraged for food and hunted small game. 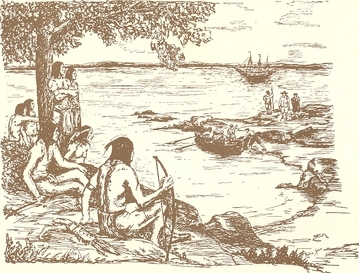 Settling along the shore and inland of the eastern seaboard, tribes would often seasonally migrate between the protected forests in winter and fertile plains in summer. In New Haven, or Quinnipiack as it was known in the pre-Columbian era, aboriginal people settled near the present day intersection of State Street and Sackett Point Road in the winter and inhabited the eastern banks of the Quinnipiac River during the summer to harvest the oysters that flourished in nearby mudflats. The settlement, in significant numbers, of Europeans along the eastern seaboard of North America began in the 17th century with the founding of colonies. Hailing from small villages located around larger cities, early arrivals to the New World were often poor families escaping religious persecution and economic stagnation in their home countries. Later arrivals from Europe tended to be wealthier merchants from cities looking to capitalize on the abundance of the land’s natural resources. For these reasons, new settlements were typically organized around a town green with a church and located along either a colonial road, river, or natural harbor where trade between other cities, colonies, and the Old World could be established. Susceptible to European diseases, the population of native inhabitants declined in large numbers soon after the arrival of European settlers. Remaining tribes were displaced from their land, which contributed to warring with colonists and other tribes. In some cases, land deals resulted in the formation of reservations, but the story of colonization is often one of land dispossession, disease, and fighting. The New Haven Colony was founded in 1638 by a reverend and a merchant on a plain located at the confluence of two creeks that lead to a deep harbor served by three rivers and bounded by two trap rock formations. By the time these settlers arrived, the native Quinnipacks had been reduced in numbers by European diseases. Remaining families sold their land in exchange for goods, protection from neighboring tribes, and a reservation on the east side of the Quinnipiac River. The Town of New Haven took the form of a maritime village with a central green and meeting house. Surrounding were agricultural fields with wilderness beyond. As the main trading towns grew denser throughout the 17th and 18th centuries, new villages were routinely established in the hinterlands to allow for the founding of new congregations, larger farming parcels, and better access to natural resources. These settlements took the form of hamlets with clusters of houses along a roadway, a church, and a small green. Larger villages formed along rivers where water power could be harnessed by mills for the production of goods. Meanwhile, the major maritime town in the region was a center for commerce and trading. Organized around the port, the small city maintained a tight footprint mostly populated with detached houses, shops, and churches – grazing fields, farms, and wilderness still surrounded. In Greater New Haven, the towns of Guilford and Orange (among others) were established as agricultural villages in the 17th and 18th centuries. Within the Town of Orange, West Haven formed as a group of small farmsteads around a central open space. Fair Haven, while within the Town of New Haven, developed separately from the City of New Haven (incorporated in 1784) as a seafaring village along the banks of the Quinnipiac River. Flanking the East Creek and the port, New Haven barely extended beyond the Nine Squares in the early 19th century. After a slow down in port activity as a result of the War of 1812, many maritime towns ventured into canal building to boost trade. Agricultural hamlets supplied raw material to mills located on rivers in nearby villages to manufacture goods that could be shipped along with artisan-produced crafts from the central city to inland towns. By the mid-19th century, however, railroads had supplanted canals as the primary mover of goods and people between cities. Manufacturing plants grew along the rails in the central city and attracted immigrant laborers from abroad. Throughout the 19th century, the rural population declined – mostly joining other recent arrivals in the central city in search of greater economic opportunity. As a result, the city grew in both footprint and density with satellite villages forming around the edges of the former port town. These satellites were cohesive communities with their own institutions, social pyramid, and industries. The Farmington Canal was dug north from the harbor along the East Creek in New Haven.The first railroad in Connecticut was laid on the west bank of the Mill River to Hartford and was later joined by the New York and Shoreline Railroads, among others. Between the Canal and the Mill River, a community distinct from the Nine Squares known as the Newtownship organized around Wooster Square. On the west side, the West Village formed at Howe and Chapel Streets. Fields separated these satellite villages from Fair Haven, a bustling oystering village, and Westville, an industrial village centered on the West River. In the late-19th century, increased industrialization led to further growth of central cities and decline of rural areas. The introduction of horse-drawn streetcars extended the fabric of the city and brought surrounding first rung villages and towns within convenient reach of the urban core. Residential suburbs developed adjacent to the streetcar lines while commercial main streets grew along them. These new residential quarters became home to upper middle class households as older areas of the city swelled with immigrants. Commercial, cultural, and civic life centered in the old port town to form a Downtown district where few people lived, but where many of the upper and middle class residents of the city worked and entertained themselves. 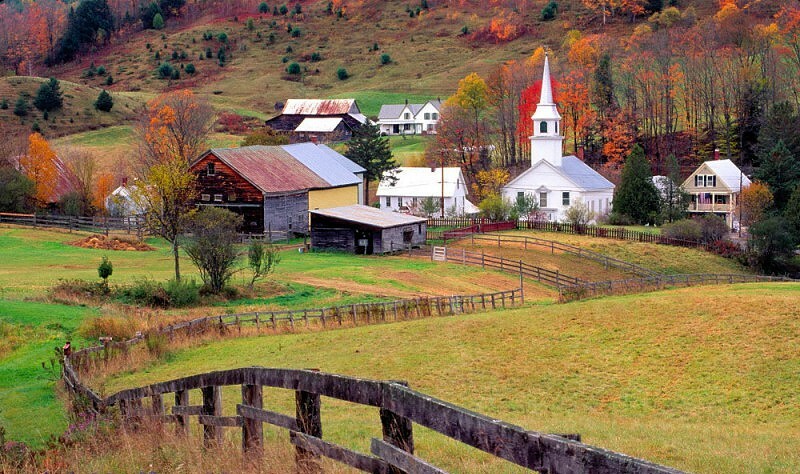 In the late 19th century, the city annexed land from neighboring rural towns in order to extend utilities. This was also a time of massive corporate expansion and consolidation. Separate freight, passenger, and streetcar railway companies were bought up and monopolized in regions across the US. Massive industrial plants located along railroads just beyond the urban core and factory neighborhoods quickly grew up around them. Electrified trolleys replaced horse-drawn streetcars by the turn of the 20th century – bringing workers to factories or offices, children to schools, shoppers to markets and stores, and couples and families to neighborhood playhouses or Downtown theaters. 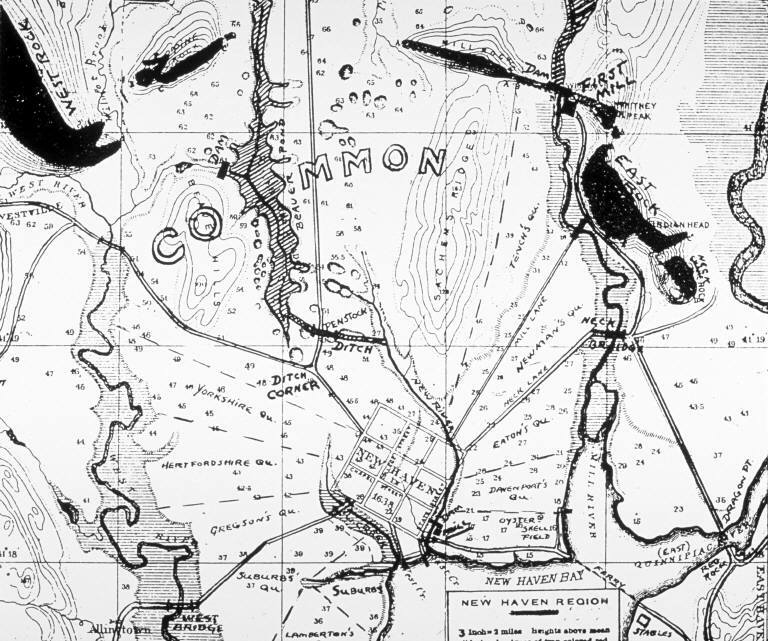 The Northampton Railroad replaced the Farmington Canal and was later incorporated into the New York, New Haven, and Hartford Railroad Company’s massive portfolio in southern Connecticut. By the turn of the 20th century, the Newtownship was considered by some to be a slum – former mansions around the park had been converted to apartments, tenements spread throughout the neighborhood, and factory smoke filled the air. Blatchley Avenue in Fair Haven was the city’s first streetcar suburb of the 1870s and 80s and while some large houses were built initially, the neighborhood transitioned into a working class area as less expensive houses were developed and factories grew on the east side of the Mill River. Meanwhile, the village of Fair Haven declined along with the oystering industry. Around the Green formed a civic center with courts, a post office, a library, and the city hall. Chapel Street grew as a retail destination and the area south of the Green became the Central Business District with 3- and 4-story commercial buildings. The harbor was separated from Downtown by railroads and warehouses with a wholesale market sprouting up nearby. On the west side of the city, a fashionable streetcar suburb of the 1880s and 90s attracted upper middle class households along the Parks Movement-inspired Edgewood Mall with middle-income two-family houses lining side streets. 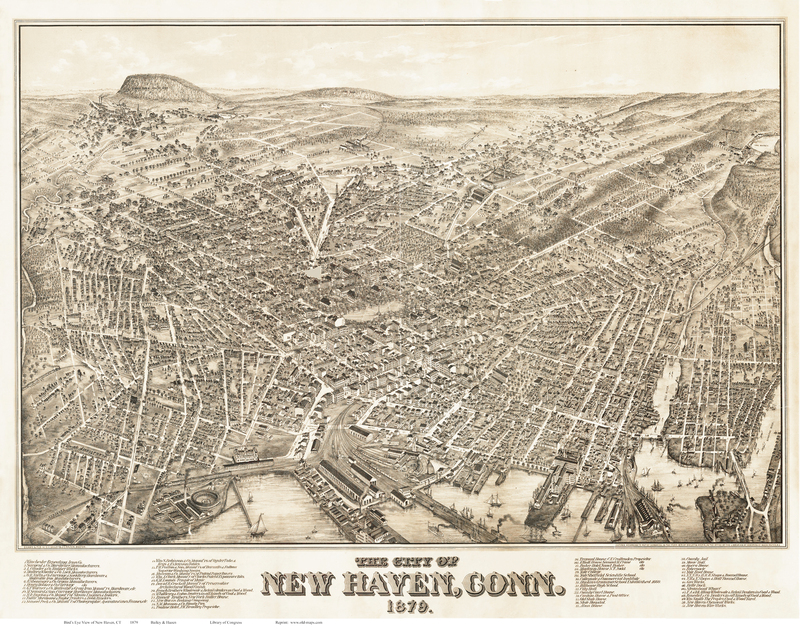 In 1870, the Town of Fair Haven joined the City of New Haven, followed in 1881 by the annexation of half of East Haven, and the consolidation of New Haven’s town and city governments. West Haven also became a Borough within the Town of Orange during this time in order to fund infrastructure investments. Between the World Wars, the automobile became prominent in American life. Fields and farmland beyond the first rung villages became available for residential development as roads and utilities were extended from the city center. These auto-oriented suburbs were predominantly made up of single-family houses and while accessible by streetcar, they were often located on land in formerly rural towns outside of the city’s boundaries. As automotive commuting increased, the Downtown became congested with trolleys, cars, trucks, pedestrians, bicyclists, and carts. Traffic from neighborhoods, suburbs, and other cities had to use the same streets to get to destinations in and beyond Downtown. Exacerbating the issue was the introduction of skyscrapers to the city’s skyline. Mechanized lifts enabled the construction of tall buildings and growing demand for office space fueled the speculative building of high-rise commercial office. On the periphery of the city, a parkway was built in the 1930s, to serve non-commercial vehicles and promote residential development. 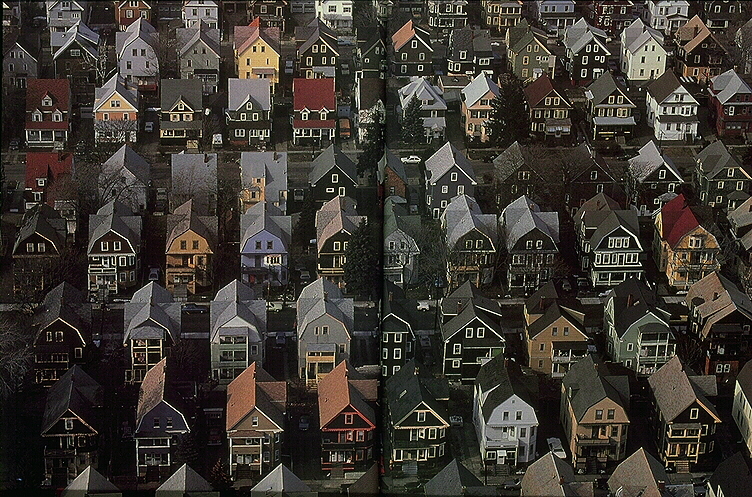 With the development of auto suburbs like the Westville Flats, West Beach in West Haven, and Fair Haven Heights, the inner rung villages of Westville, West Haven, and Fair Haven became fully engulfed within New Haven’s urban fabric by the mid 20th century. Older streetcar suburbs and factory neighborhoods grew denser and more diverse, while Downtown expanded and industrial zones solidified near railways. In 1920, Westville began paying city taxes, and the following year West Haven incorporated as its own town. Construction of the Wilbur Cross Parkway began in 1937 to connect New Haven County with Fairfield and Hartford Counties and promote residential development west of New Haven. In the middle decades of the 20th century, the city conducted a radical experiment that would transform the entire region. By the 1940s, most streetcars had been replaced by buses, traffic was gridlocked in the city center, and most new development was occurring in neighboring suburban towns. Using Federal and State funding under national housing and highway acts, municipal redevelopment agencies across the country demolished older areas of the city labeled as “blighted”, constructed highways through the heart of the city, and built enormous commercial, industrial, residential, and civic structures oriented entirely around the automobile. Informed by planning professionals and academics of the Modern Movement, Urban Redevelopment aimed to bring suburban shoppers to Downtown Malls, suburban workers to Downtown offices, alleviate traffic through the city, and encourage upper income households to move into the city. In New Haven, two-thirds of the Wooster Square neighborhood was demolished in order to build Intestate 95 and an adjacent industrial park. A large part of the harbor was filled in for the construction of another industrial park and Interstate 95. The entire Oak Street and Legion Avenue neighborhood was bulldozed – isolating the southern portion of the city – to build a highway connector from the I-91 and I-95 interchange to Route 34, half of which was never constructed. 70% of Downtown was torn down for the Chapel Square Mall, parking garages, hospital and university buildings, a civic center, and medical and commercial offices. The construction of several large housing complexes in the Dixwell neighborhood effectively replaced the intimate streets and tight knit community with high-rise towers, low-rise bunkers, and parking lots. Ravaged by redevelopment, depopulated by highway construction, and lacking access to economic opportunities in and around the city, many older neighborhoods became ghettoized despite their charming tree lined streets and solid building stock. Rather than helping the city, the construction of interstate highways through cities accelerated population loss, particularly of middle and upper income households. Industrial jobs steadily declined in the late 20th century as companies were bought and sold by multinational corporations that would rather move a production line across country or to another country than deal with labor unions. 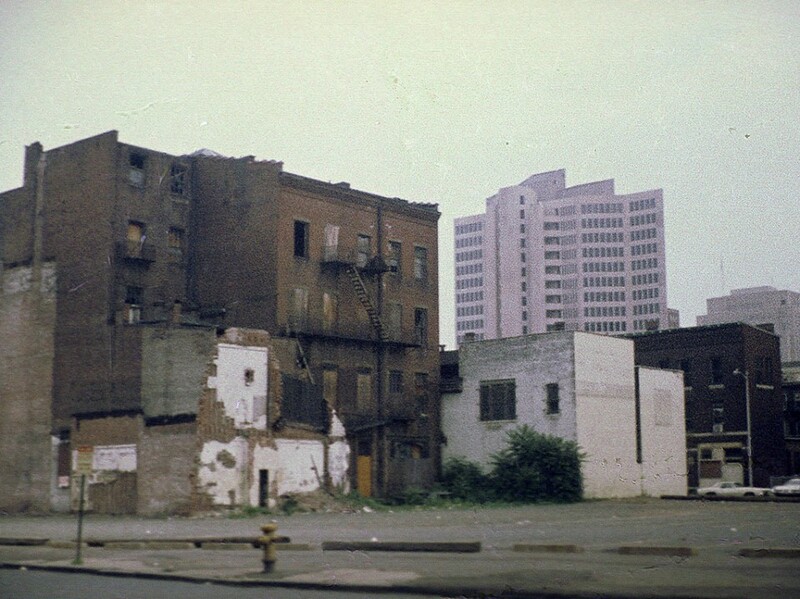 Some factory neighborhoods became ghettos for a demoralized underclass and even some streetcar suburbs fell victim to high crime rates, abandoned buildings, and downward mobility, stemming in part from residential segregation. The city subsidized some commercial office development in the Downtown, but residential and retail uses concentrated in exurban areas around highways in formerly rural towns. The Central Business District became a virtual ghost town with few permanent residents and increasing storefront vacancy. The subdivision of farmland in exurban locations provided cheap land to develop strip malls, office parks, and residential communities without the city burdens of high taxes, crime, and inconvenient parking. The final decades of the 20th century saw new residential developments spring up in towns like Orange and Guilford, while houses were being burned and torn down in New Haven’s former factory neighborhoods. Sprawling industrial plants like Winchester Repeating Arms lay mostly abandoned and decaying, a freight railroad sat idle in the middle of Newhallville, and a formerly bustling wholesale district between the Oak Street Connector and the Green was deserted. Despite the absence of Federal funding for large scale urban redevelopment, the city around the turn of the 21st century has begun one type of revival. The introduction of community policing based around neighborhood walking beats, the investments of universities, institutional, and non-profit organizations in developing retail, residences, and services, and a renewed interest in urban living based around walking, biking, and community life have helped to repopulate some neighborhoods, spur development, and improve the image of the city as a viable place to live, work, shop, and enjoy. On the whole, however, the city remains the principle service provider and home to the region’s neediest populations, while providing the majority of the living wage jobs – most of which are worked by suburban and exurban residents. As a result, the city budget is dependent on State funding and suburban towns are dependent on the city for jobs while not providing housing and services for a significant portion of the region’s service-requiring populations. 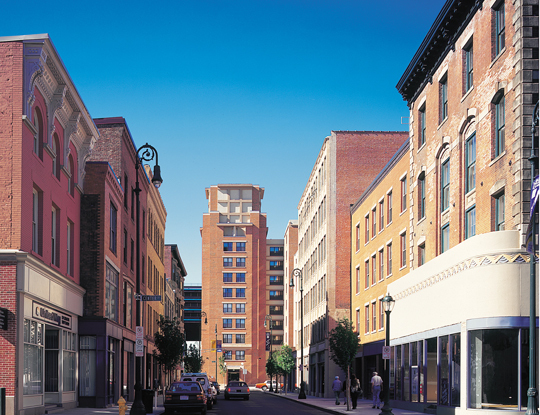 While exurban areas continue to develop shopping malls and residential communities around highways, New Haven has managed to add thousands of new residents to its Downtown and several city neighborhoods. As young professionals, recent college grads, and young singles seemingly flock to urban centers in search of better job opportunities and an active night life, rental housing construction has boomed. Growing companies are also looking for ways to attract talent and impress clients, which supports commercial construction and the food services industry. Increased demand for bio-medical related facilities has even prompted the City of New Haven to reconfigure the Oak Street Connector from a depressed, limited access freeway to development parcels flanked by a pair of surface streets that will be bridged by restored connections across Temple and Orange Streets. Cycling infrastructure, increased passenger and commuter train travel, and the conversion of the Farmington Canal into a recreation trail have begun to restore balance and reintroduce a variety of transportation options. Future planning and development efforts for regions might focus on balancing the provision of services, affordable housing, transportation, and commercial establishments between each neighborhood and district within the region so that no one neighborhood has to carry a burden while another reaps the benefits. Development should be respectful of the existing scale and character of neighborhoods, but residents of each neighborhood should have the opportunity to walk or bike to work, school, shopping, parks, and transit stops that provide convenient access to regional destinations. Development of this sort might see strip shopping malls converted to mixed-use centers with residences and offices above stores and hidden parking. Existing town centers might encourage more residential development, better service provision, and improved transit infrastructure. Low-density residential areas might encourage more productive agricultural gardening, laborer housing, markets, and home offices. Suburban neighborhoods could incorporate owner-occupied rental housing, corner cafes, and professional offices. City neighborhoods should encourage commercial development and housing rehabilitation to attract middle and upper income households and workers. Downtown should continue developing market rate housing with a good amount of ownership options for families in addition to small rental units. Metropolitan regions should strive to be places of opportunity for all people regardless of income and background. Regional resources should be available through a variety of transportation options that are convenient, safe, and affordable. Every neighborhood should have desirable and affordable housing in addition to employment, shopping, educational, civic, and recreational opportunities. A region that achieves these qualities necessarily has to change its form – as its done throughout history. In American regions, in particular, the city’s form should relate to pedestrians and transit with accommodations made for cyclists and drivers when practical. Fortunately, recent development appears to be moving towards pedestrian and transit-oriented design for the first time in a century, but continued progress on safety and convenience is required if alternate transportation modes are to become viable options to driving. From seasonally-inhabited aboriginal encampments to a dispersed constellation of villages to a compact monocentric industrial city to a sprawling codependent city-region, American urban form has changed enormously over the past four centuries, and it will continue to change as we attempt to shape its growth in the future.